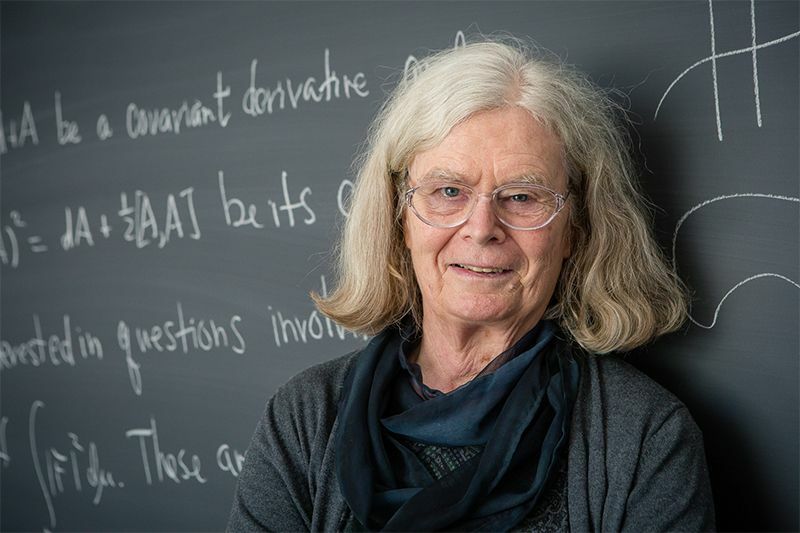 Mathematician Karen Uhlenbeck has spent her life uniting math and physics and the international community is now uniting to recognize her achievement of being the first woman to win the prestigious Abel Prize (sometimes called the “Math Nobel”). Uhlenbeck is perhaps best known for her work on soap bubbles. Soap molecules have water-loving parts and water-avoiding parts, so they arrange themselves into bubbles in which the water-loving parts face water and the water-avoiding parts are hidden inside the bubble. And they “squish close together” to reduce surface tension. This minimizes their energy, creating “minimal surfaces” which are more stable. But she found parts of these otherwise low-energy surfaces where there was a high concentration of energy, and discovered that these high-energy points were places smaller bubbles were splitting off from. Uhlenbeck was born Karen Keskulla in Cleveland, Ohio in 1942. She was raised in New Jersey and earned a PhD in mathematics from Massachusetts’ Brandeis University. After several teaching positions at different universities (where she experienced gender discrimination), she accepted a position at the University of Texas at Austin in 1987 and remained there until retiring in 2014. Other of her honors include receiving the US National Medal of Science (2000) and becoming the 2nd woman to give a plenary lecture at the International Congress of Mathematicians (1990) – the first was almost 60 years prior, but Emmy Noether.Uhlenbeck has helped pave the way for other female mathematicians by, among other initiatives, founding the Women and Mathematics program at Princeton University’s Institute for Advanced Study. Congratulations Dr. Uhlenbeck!